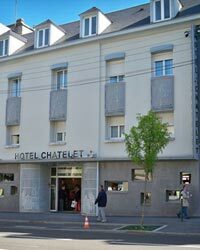 Looking for a Chartres Hotels? Confuse in choosing the best one? I hope this page would give you some ideas! 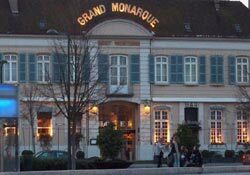 Le Grand Monarque hotel is a Best Western hotel, quite a famous hotel in Chartres. This hotel obtained four star rates in 2011. Has 55 rooms including 5 suites, all rooms have free Wi-Fi connection and a plasma wide screen television. The hotel offers a convention room and a business lounge with fully seminar equipments. Property amenities include mini bar and on-site restaurant, spa, swimming pool, fitness center. Coming with your pet? Good news... Le Grand Monarque is a pet-friendly hotel! A brand new Accor hotel in down town Chartres, opened on February 2010. Has 67 rooms including 3 rooms for the reduced mobilities - all rooms are non smoking room, air conditioned and sound proofed rooms. A minibar, a safe deposit box, a satellite television and Wi-Fi are on your service when you enter the room. Property amenities include a lounge bar, a tea room and an indoor garden. Pets are welcome in Mercure Hotel Chartres. Wonderfully renovated in 2006, only 100 m away from the train station. Has 48 rooms (including 30 rooms with the cathedral view), Wi-Fi access and a cable television are available in each room. Complementary amenities include bar and lounge, three seminar rooms, private parking, bike and car rental service. Pets are not allowed. Chartres shopping center, the cathedral and the old city are on walking distance. Has 37 rooms including one suite room, 7 rooms for the disabled guests and connected rooms which suitable for family. Complementary room amenities include internet, telephone and television. Pets are welcome. 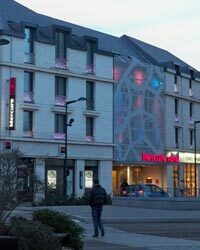 Another Accor hotel in Chartres. Less than 10 minutes walk to cathedral and located on the Eure river side which give you access to the Parc Leon Blum. Has 82 rooms – including 3 rooms for the disabled guests. Complementary room amenities - air conditioned, free Wi-Fi, telephone, a cable satellite television and wake up call. On-site a café restaurant Pasta & Cie with all Italian taste, a bar with 24 hour snack service, a terrace heading over the Eure river, meeting rooms, indoor and outdoor parking. – It’s a friendly pets hotel. A small hotel with 17 rooms. Room features include Wi-Fi access, telephone and television. The plus point for this hotel is having a great view to the cathedral. 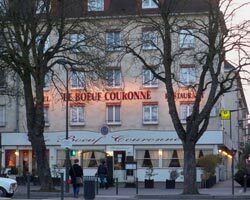 For your tasty meals, they offer a convenient on-site restaurant with an excellent specialité cuisine of the region. Ideal for visit in family or groups. 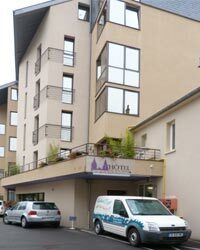 Novotel Chartres Hotel located about 4 km away from Chartres center, direction to Paris. Opens 24 hours opened - has 112 rooms, including 2 rooms for the disabled guests and 5 meeting rooms. Not all rooms are non-smoking rooms. Room amenities include Wi-Fi, cable satellite televisions, radios, cribs and minibars. For your convenience, wake up call service is available. Keep your body fit with on-site outdoor pool and fitness center or having fun with the whole family in the play area and have convenience of their restaurant and bar. It is a friendly pets hotel. The location is about 3 km away from downtown of Chartres. This pet-friendly hotel offers 48 rooms plus 2 rooms for the disabled persons. A courtesy tray with tea, coffee and small snack is daily available in your room, including also a satellite television, a direct dial telephone and a modem. Amenities include a meeting room, a terrace and garden, a free parking – also available a tasteful restaurant to comfort your breakfast, lunch or dinner. 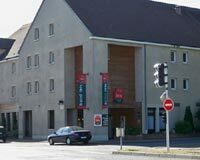 As you can notice from its name, this hotel located 4 km away in the west of Chartres center. Has 74 rooms, including 3 rooms for the reduced mobility guests, are air conditioned - with complementary free Wi-Fi access, telephone, a satellite cable television and wake up call service. Connecting rooms are also available. Their on-site restaurant Café Vin & Cie offers you to discover the world of wine and choose the best wine to fit each meal – their bar with terrace is 24 hours opened. Complementary amenities include a meeting room, free outdoor parking, internet corner. This is a pet-friendly hotel. Only 5 minutes away from Chartres center. Has 77 rooms - rooms for the disabled persons are available. A cable television, direct dial telephone and free Wi-Fi access welcome you in your comfort room. Amenities include also a seminar room for your business trip needs, on-site restaurant and a bar. Ready to welcome you in French and English. It is a pet-friendly hotel.